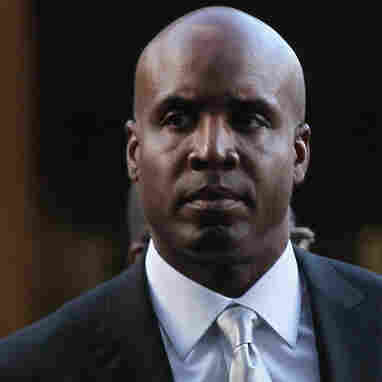 Court Throws Out Slugger Barry Bonds' Conviction : The Two-Way In 2011, Bonds was found guilty of obstruction of justice but a federal appeals court has just thrown out that conviction. A federal appeals court has thrown out Barry Bonds' 2011 obstruction of justice conviction. If you remember, a jury weighed whether Bonds lied to a grand jury about his use of performance enhancing drugs. They could not reach a verdict on those three charges but convicted him of intentionally giving false or misleading statements to the grand jury about whether his former personal trainer ever injected him. The United States Court of Appeals for the Ninth Circuit, however, ruled on Wednesday that a single "rambling, non-responsive answer to a simple question" did not have the capacity on its own "to divert the government from its investigation or influence the grand jury's decision whether to indict anyone." The statement in question was in response to a question on whether Bonds' personal trainer, Greg Anderson, ever gave him "anything that required a syringe to inject" himself with. Bonds gave a long answer, in which he essentially explained that he didn't talk shop with friends, including Greg. "The most one can say about this statement is that it was non-responsive and thereby impeded the investigation to a small degree by wasting the grand jury's time and trying the prosecutors' patience. But real-life witness examinations, unlike those in movies and on television, invariably are littered with non-responsive and irrelevant answers. This happens when the speaker doesn't understand the question, begins to talk before thinking (lawyers do this with surprising frequency), wants to avoid giving a direct answer (ditto), or is temporizing. Courtrooms are pressure-laden environments and a certain number of non-responsive or irrelevant statements can be expected as part of the give-and-take of courtroom discourse. Because some non-responsive answers are among the road hazards of witness examination, any one such statement is not, standing alone, 'capable of influencing . . . the decision of [a] decisionmaking body.'" Other judges provided different rationales for throwing out the conviction. Judge Johnnie B. Rawlinson was the sole dissenter in the case. Using baseball terms, she said that the her fellow judges had "struck out" with their opinions and that she was crying "foul." Essentially, she argued, the court had overstepped its legal bounds by second-guessing a jury, which had already decided Bonds' statement was material. "Barry Bonds received a grant of immunity in exchange for his truthful and candid testimony before the grand jury," she wrote. "Rather than aiding the grand jury in its investigatory quest, Bonds elected to obstruct the grand jury process by giving evasive testimony."